This paper attempts to take a comprehensive look at the Indian silk industry and to identify the key issues of the sector. The impact of silk imports on domestic silk industry and sericulture are analyzed based on available data up to the year 2005. While the paper doesn’t offer any solutions for the problems, a few issues are thrown up which call for immediate research attention. The available (very few) studies on the economic issues of Indian silk industry are reviewed. The analysis has been restricted up to the year 2005 considering the fact that no much change has taken place in the industry since then. 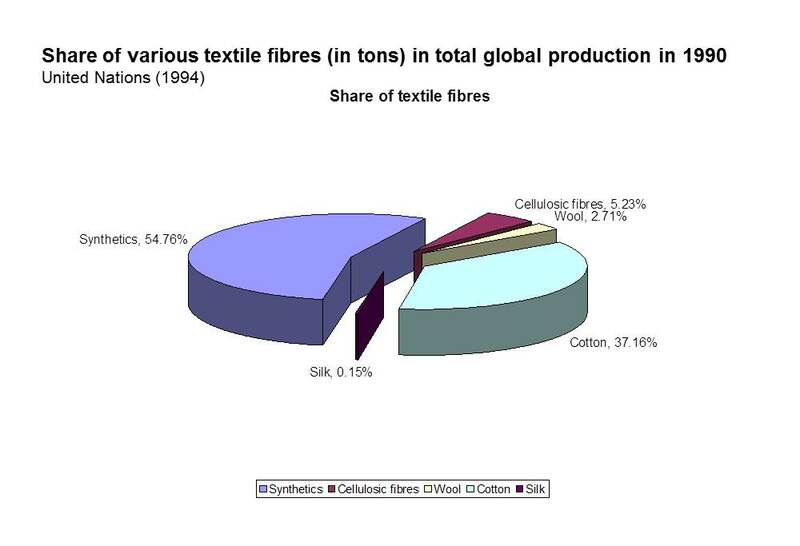 Silk has a miniscule percentage of the global textile fibre market- less than 0.2%. But this figure can be a gross under-estimation, since the actual trading value of silk and silk products is much more. The unit price for raw silk is roughly twenty times that of raw cotton. The annual turnover of the China National Silk Import and Export Corporation alone is US$ 2–2.5 billion (ITC Silk review, 2001). Sericulture has important socio-cultural implications. Studies have established large scale employment generation potential and high income generation potential of sericulture (Hanumappa, 1986). Jayaram et.al (1998) showed that every acre of sericulture practiced under irrigated conditions had a potential to employ 247 men and 193 women round the year. They have also shown that the small scale mulberry farms provided ample scope for employment of owned family labour and suggested its potential to solve the problem of seasonal unemployment. Lakshmanan et.al; (1999) found that female labour is quite dominant in all sericultural activities, to an extent of nearly 50%. Saraswathi and Sumangala (2001) observed that in the indoor activity of silkworm rearing women participation was as high as 94.67 % and that except for the peak period the entire sericultural activity is conducted using family labour. Most of the activities in silk production are in the informal sector and menial in nature. Thus about 90% of the employment goes either to the landless or to the marginal farming families that hire out these labour, or to the sericulture families (Sinha, 1989). 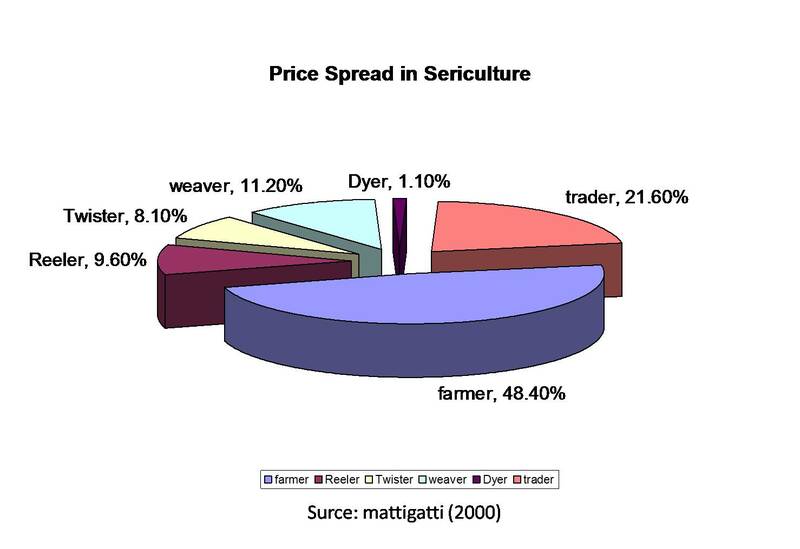 While considering the price spread in the whole industry, it can be seen that 48% of it goes to farming sector, as illustrated below. Sericulture and silk production are labour-intensive at the village level, employing both men and women at all stages of production (note-1). In China, it occupies some 20 million farmers, as well as 5 lakh people in the silk processing industry (ITC silk review 2001). In India, sericulture is a cottage industry in 59,000 villages, providing full and part-time employment to some six million people from the farm sector, and silk processing industry (ITC silk review 2001). Sericulture in India – it’s past and present. The silk trade flourished in India during the medieval period. Under the Moughals, silks from Kashmir and Bengal were exported mainly by the Moors, who during the 14th and 15th centuries transmitted it to Europe (Nanavaty, 1990). The British had identified the qualitative shortcoming with Indian silk and tried to improve it by bringing experts to modernize the rearing and reeling techniques. In 1771, the ‘China worm’ was introduced with the idea of improving cocoon quality. The government promoted the extension of land under sericulture. Rent was slashed by half for those lands, and that too was exempt for the first two years of cultivation. The government also promoted a higher wage structure for processing raw silk (Ray Indrajit, 2005). Technology was substantially improved in conformity with the European know-how and practices so that British weavers accepted raw silk of Bengal. In fact, the overseas market responded very favorably to the first consignment of the new technology in 1772 (Ray Indrajit, 2005). The government was also successful in diffusing Chinese worms in sericulture. Another breakthrough was achieved in the sphere of the production system. The government successfully organized sericulture as a cottage industry. The industry’s technology and organization were thus thoroughly reformed by the close of the eighteenth century in tandem with the requirements of the European market. Consequent to the abolition of British East India Company’s monopoly on private trade the company wound up its silk trade in 1833, leaving it to private entrepreneurs. During the last quarter of 19th century Bengal silk began to decline due to lack of proper organization, husbanding authority and the absence of technical know how (Ray Indrajit, 2005). Hanumappa and Erappa (1988) cites sericulture development in the princely state of Mysore as an example of the crucial role the state can play in augmenting the sources of rural income. Sericulture flourished in Mysore during the 18th century under Tipu Sultan. The technology was transferred from Bengal. Japanese and Italian silkworm strains were imported and experts hired from these countries (Nanavaty, 1990). Spread of diseases during 1866 and the world depression in 1929 along with competition from imported silk and rayon lead to downfall of Indian silk industry on the eve of World War II. A tariff protection commenced from 1934 to save the industry from cheap imports of silk (National Commission of Agriculture, 1976). Durng the World War II, the Indian silk industry again surged, mainly due to demand from the Allies for silk for manufacture of parachutes (note- 2). The first authentic inquiry into the conditions of Indian silk industry was undertaken in 1914-15 by H. Maxwell Lefroy and E. C. Ansorge (Lefroy and Ansorge, 1915). In a report they observed that the industry was scattered and unorganized producers were subjected to exploitation. They suggested formation of a central organization to address the needs of the industry (Lefroy and Ansorge, 1915). Subsequent recommendations by a Silk Panel in 1946 lead to the formation of the Central Silk Board in 1949. Central Silk Board (CSB) is a statutory body, under the administrative control of the Ministry of Textiles, Government of India. One of the earliest commodity boards to be constituted by the Government of India, the Board coordinates the development of sericulture and advises the Government on policies governing export and import. It has the responsibility for pre-shipment inspection of silk goods exported from the country. The Board is also responsible for organizing sericultural research, training, basic seed (egg) production and collection of statistics pertaining to sericulture and silk industry (National Commission of Agriculture, 1976 and Gopalachar, 1978). The Central Silk Board (CSB) established a number of sericulture research institutions in 1960s. With systematic efforts, it became possible in 1970s to develop a technology suitable for tropics. New mulberry varieties coupled with agronomical practices were made available to the farmers. Packages of practice were developed for silkworm rearing, besides realising new bivoltine races. Popularisation of the bivoltine hybrids was given priority. Since seed preparers started using bivoltine as a male parent for the preparation of cross breeds, the traditional poor yield crosses have been replaced to the extent of 85%. Consequent to this, mulberry sericulture was spread to non- traditional states like Kerala, Maharashtra, Rajasthan and Gujarat in the 1980s. While other crops (grains) perish due to very little precipitation, mulberry survives such acute situation where ground water is also not available for raising the crops, thus providing subsistence to a large number of farmers (National Commission of Agriculture, 1976). Currently in India mulberry silk is chiefly produced in 5 states viz. Karnataka, Andhra Pradesh , Tamilnadu , West Bengal and Jammu & Kashmir, contributing to about 99% of the total mulberry silk produced. Interestingly, the states of A.P and T.N with almost no silk production during 1960 (Vasumathi, 2000), currently occupy the second and fourth position respectively. West Bengal at present contributes about 11.8% of the total cocoon / silk production, while Karnataka contributes the lion's share (43.95%) with Andhra Pradesh and Tamilnadu contributing 38 % and 4 % respectively. Production statistics up to 2005 is furnished in table 1. Table 2 gives India’s export, import and demand supply gap. The annual production of raw silk in India was 17305 tons, of which mulberry raw silk alone accounts for 15445 tons in 2005. The demand for raw silk was much higher than the production at 10180 tons. Hence, India imported 10538 tons of raw silk in 2005. The imports have steadily increased from 6015 tons in 2000 to 10538 tons in 2005 representing a compound annual growth rate of 9.8%, against a mere 0.25% compound growth rate in production. Over the five year period the demand supply gap has increased by 73%. The imports as a percentage of production have increased from 39% to 68%. This analysis indicate that India has neither been able to meet the increasing demand for silk in the domestic market by increasing domestic silk production, nor to exploit the huge export potential; instead resorted to rawsilk imports to fill the domestic demand supply gap. Table 3 gives India’s export earnings from silk (all commodities) over the period 2000 to 2005. 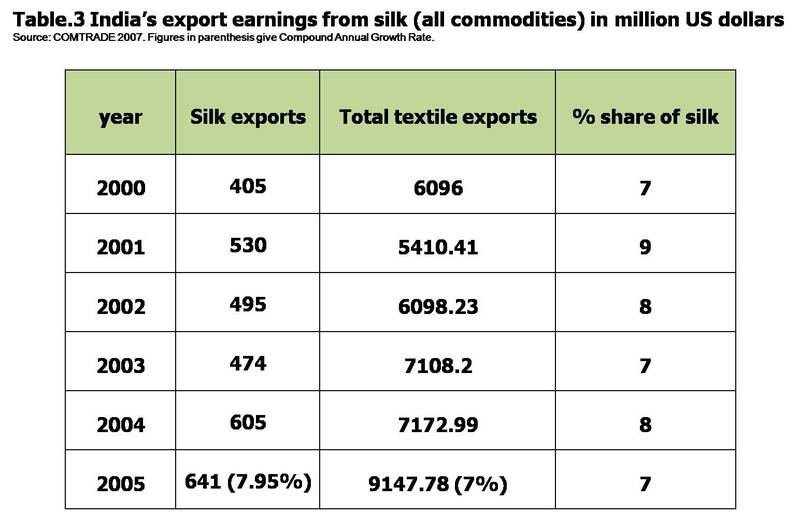 It is seen that though the silk exports showed a compound growth rate of 7.95% over the years, its percentage share in total textile exports from the country has been stagnant over the years. Table 4 gives the value of silk and other textiles imported by India over the years. The percentage share of silk in the total textiles import has increased over the 6 years by 5.7%, whereas the net foreign exchange earning from export and imports has remained stagnant. 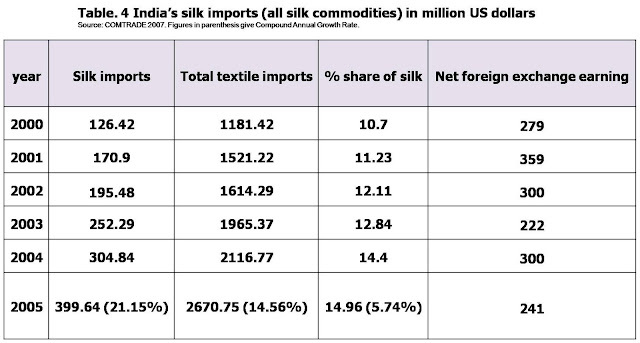 From the above analysis it is clear that even after being the second largest producer of silk, India contributes only 16% of global silk production and it is the largest importer of rawsilk. India has been unable to meet the increasing demand for rawsilk by the domestic industry through increasing domestic supply. This is because of two reasons namely low productivity and low quality. Apart from India’s inability to exploit the export potentials and dependency on imported raw material, another grave issue is pertaining to cheap imports of raw materials ruining the domestic sericulture industry. 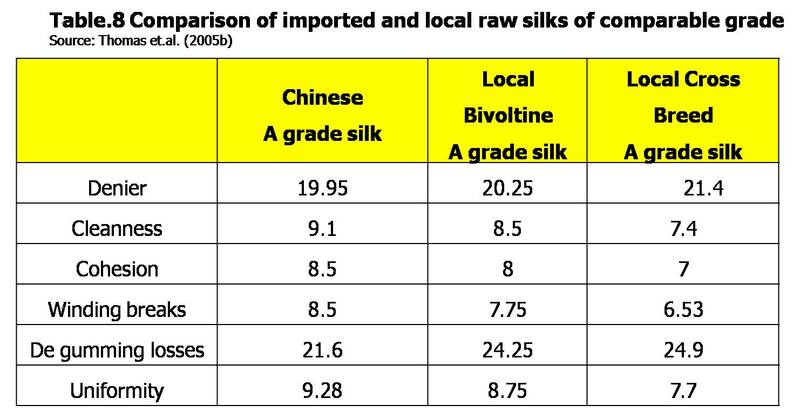 It is reported that Chinese raw silk and silk fabrics are reportedly being imported into the country at very low prices (Tikku, 1999). 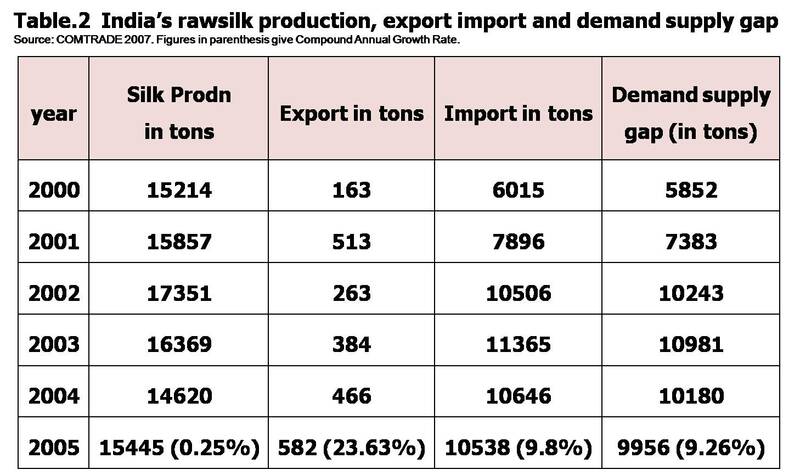 The data furnished in table 4 reveal that the rawsilk imports to India increased from 7896 tons in 2001, to 10506 tons in 2002, which is a 33% increase in one year. During the subsequent year the domestic silk production fell by 5.6% (from 17351 tons of 2002 to 16369 tons of 2003).The domestic silk production further fell by 10% (from 16369 tons of 2003 to 14620 tons of 2004). 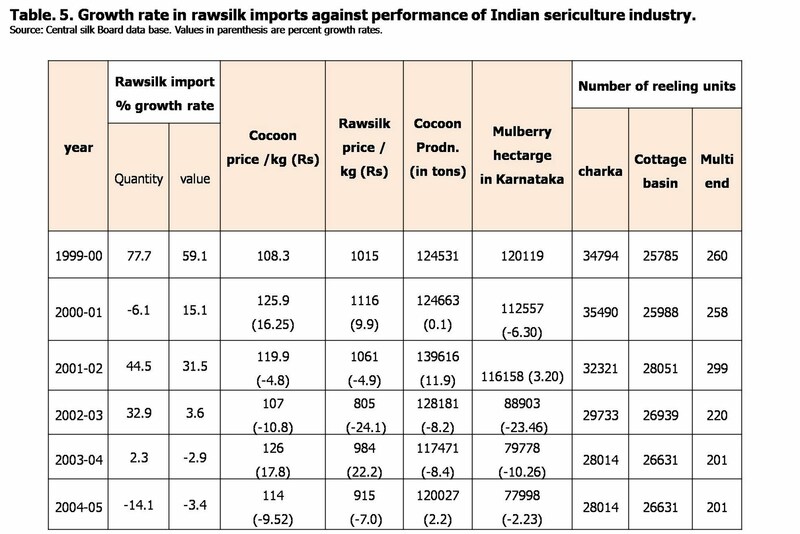 Table 5 compares the annual growth rate in rawsilk imports for five years from 2000 against the performance of Indian sericulture industry and reeling sector to generate an idea about the comparative dynamics (Note:3). It is seen that the growth rate of silk imports were very high from 1999 to 2003 except for 2000-01. 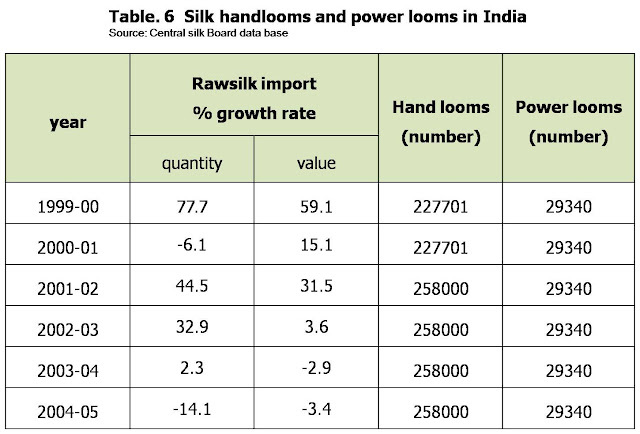 The growth rate in the value of imported silk (in Indian Rupee terms) has been lower than that of quantity of imports. The prices of domestic rawsilk and cocoon are observed to be worst affected during the years 2001-02 and 2002-03, the periods in which imports grew very high and prices of imported silk kept falling. Thomas et. al (2005a) showed that the cocoon price get influenced by the yarn prices with a lag of six to ten days. From the table 5, it is clear that during 2001-02 and 2002-03 when domestic rawsilk prices fell by 4.9% and 24.1 % respectively, the cocoon price also fell by 4.8% and 10.8%. This has impacted on cocoon production, lowering it by 8.2% and 8.4% during 2002-03 and 2003-04 respectively. The data shows that the effect of imports influenced the mulberry plantation also. During 2002-03 in Karnataka alone 23% of the existing mulberry plantations were uprooted and in the subsequent year another 10% uprooting occurred. 6780 charka reeling units have closed down over the six years where as the number of cottage basin reeling units have increased by 846 only. The number of multi-end reeling units has also fallen by 59. This means considerable labour displacement from the charka sector during the six years which is not likely due to up gradation of the charka units into cottage basins. The fall in: prices, quantity of cocoon production and mulberry area and labour displacement from the reeling sector cannot be completely attributed to the rawsilk import. Many other socio economic factors could be at play. However it is seen that subsequent to a protectionist intervention of the government during 2003, the quantity of imports fell by 2.3%, domestic rawsilk prices increased from Rs. 805.00 to Rs. 984.00 per kg (22.2% growth) and cocoon prices increased by 17.8% (note-4). During the subsequent year the quantity of cocoon production showed slight improvement (2.2% growth) and the mulberry uprooting rate came down from 10.26% to 2.23%. This indicates that the silk imports have had a deleterious effect on the domestic sericulture. 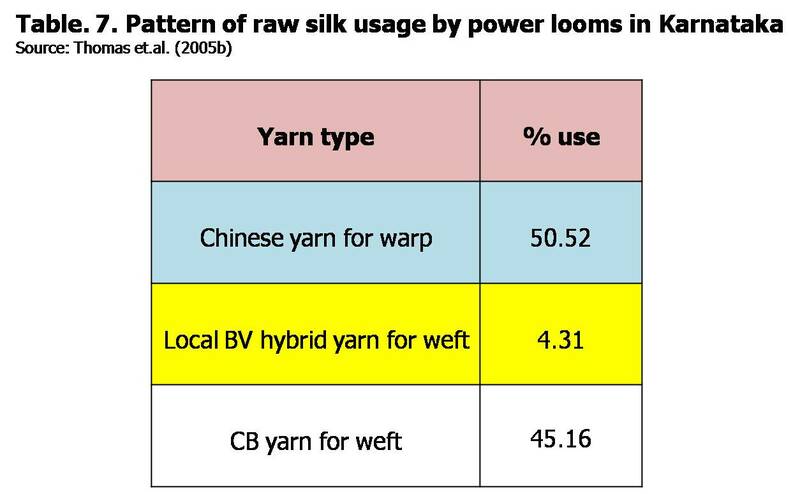 It is generally held that the imported rawsilk is consumed by the powerlooms since power looms require qualitatively superior and strong yarn for the warp and the relatively poor quality local yarn is fit for the weft only (Thomas e.al, 2005b and Vasumathi, 2000). Table 6 gives the growth rate of rawsilk imports over 6 years from 1999-00 against number of handlooms and power looms in the country. It is seen that the number of power looms have stagnated at 29340 over the years and the number of handlooms have increased by 30299 during 2001-02. 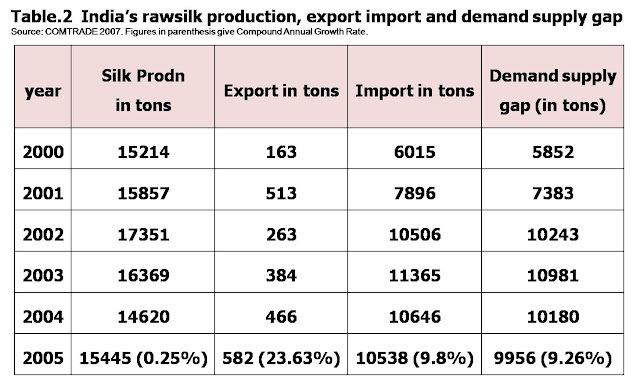 The rawsilk imports have been in the increase. Thomas et.al. (2005b) found that only 50-53% of the yarn requirement of the power loom sector is met from Chinese imports. Thus it may be inferred that a considerable portion of the imported yarn is being absorbed by the handloom sector also, which is traditionally known as the sole consumer of charka silk (Vasumathi, 2000). Thomas et.al. (2005b) also have shown that the imported Chinese silk is superior to the locally available silk with respect to denier, cleanness, cohesion, gumming losses and uniformity. 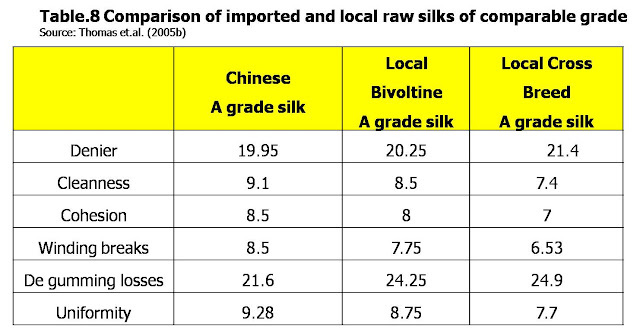 Table .8 presents a comparison of imported silk with local silk based on these attributes. Naik .G & Babu (1993) have estimated that the total high quality silk production in India could meet at the most 60 percent of the estimated demand and have cautioned about the negative implications of the Chinese raw silk on the development of Indian silk industry. They also noted that diversion of imported silk into domestic sector benefit only the consumer. By avoiding this diversion, the demand for domestically produced high quality silk would have increased the good health of the industry. Some of their recommendations for amelioration of the current situation include - improvement in research and extension facility, adequate supply of inputs and proper marketing facilities and modifications in the production system. In spite of its small volume in global textile production, silk has importance in developing economies primarily because of its favorable socio economic consequences. The development of sericulture had been the states priority in every country. The case of Indian sericulture is no exception to this. A number of regulations were made in favor of the farm sector. Many ambitious projects were launched and a large number of technologies made available. In spite of all this, poor productivity, poor quality, high cost of production and labour intensity continue to be the hall marks of Indian silk industry. In order to cater to the needs of sophisticated power-looms and in response to the relaxation in exim policies, large quantities of high quality silk has been imported at prices lower to local silk. This has disrupted the domestic silk reeling industry and sericulture farm sector, leading to considerable labour displacement. Protectionist government interventions have temporarily eased the problem. But how long tariff protections could help the domestic industry is a question. Data shows that imported silk is finding place even on the traditional handlooms, clearly demonstrating its comparative advantage. The recent data shows that the price of imported silk is in the increase while the government has announced a slash in customs duty of raw silk imports from 30% to 5%. While the farmers and reelers staged an agitation the weaving sector welcome the gesture. Thus the industry is divided in its opinion on cheap imports, indicating the necessity for the government to take appropriate policy decisions. Where does our comparative advantage lie? Is it in the sericulture farm sector or in the silk weaving industry? If the farm sector has to survive, is it sufficiently equipped to take up the challenge of ensuring high quality raw material supply? If this is ensured, is the silk reeling sector capable of absorbing the high quality cocoons? These are the questions that the Indian silk industry has to answer before proceeding any further. 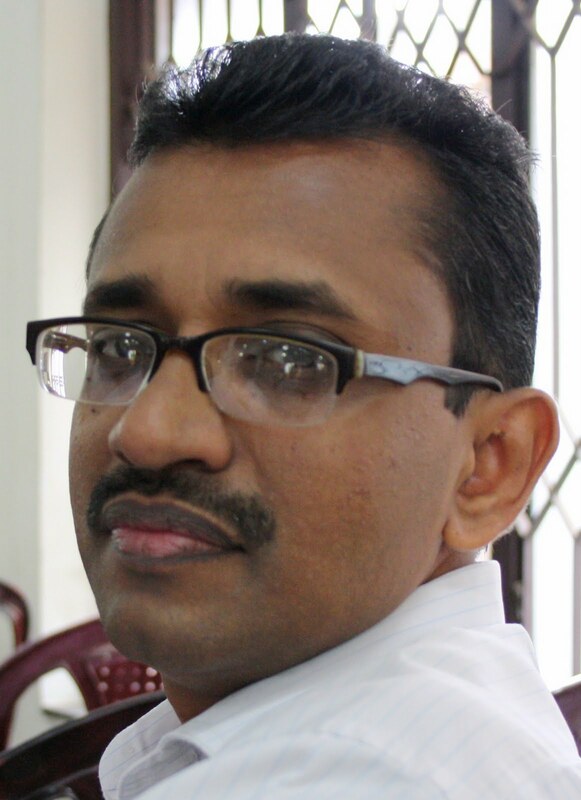 Gopalachar, A.R.S. (1978) 3 Decades of Sericultural Progress (Sericulture Industry in India Potential and Prospects) pub. Central silk Board, India. Hanumappa, H.G. and Erappa, S. (1988) Sericulture in Princely Mysore (1914-1945) a Survey. Paper presented at Seminar on South Indian Economy,C. 1914-C. 1945. CDS, Trivandrum, April, 25-28, 1988. Hanumappa,H.G., and Erappa, S. (1986) Economic issues in sericulture: Study of Karnataka. ”Economic and Political Weekly” 20(31)1322-1324. Jayaram, H., Mallikarjuna, V., Lakshmanan, S., Ganapathi, Rao, R. and Geetha, Devi, R. G. (1998) Labour Employment Under Different Mulberry Farm Holdings-a Comparative Study. Indian Journal of Sericulture, 37(01), p52-56. Naik Gopal and Babu KH, (1993), Demand and Supply Prospects for High Quality Silk,Oxford & IBH Publishing Co. Pvt. Ltd, New Delhi. Nanavathy, M. (1990) Silk, Production, Procesing and Marketting, Pub: Wilely Eastern Ltd.
Sinha, Sanjay (1989) Development Impact Of Silk Production, A Wealth Of Opportunities. “Economic and Political Weekly,” January 21, 157-163. Thomas Jacob, Arun Kumar, K.S, Reddy and Lalith. A (2005a) Quantification of Relationship Between Silk Cocoon and Silk Yarn Prices- an Application of ARIMA Model. In Reading in Sericulture Economics Marketing and Management. Eds. K.S. Arun Kumar, R.K. Datta and G. srinivas. Pub: Santhosh Creations, Bangalore. Thomas, Jacob., Arun Kumar, K.S, Lalith. A and Reddy.S (2005b) Requirement of Quality Silk Yarn of The Power Loom Sector-A Quantitative Analysis. In Reading In Sericulture Economics Marketing And Management. Eds. K.S. Arun Kumar, R.K. Datta and G. Srinivas. Pub: Santhosh Creations, Bangalore. United Nations (1994) “Silks In Asia,” Economic and Social Commission for Asia and the Pacific. Vasumathi ( 2000) An Analytical Study Of The Silk Reeling Operations In Karnataka. The article is really very good and gives a good insight into the present status of Indian sericulture. It would have been wonderful if you could have provided latest statistics. One good news is TNAU has started the B.Sc. (Sericulture) course during this academic year. Already 24 seats out of 30 seats has been filled in the I phase of counselling itself.